Within this garden we wanted to create a space which was not only on numerous levels, but also had various points of interest. This garden is on a slope, but is also very wide. 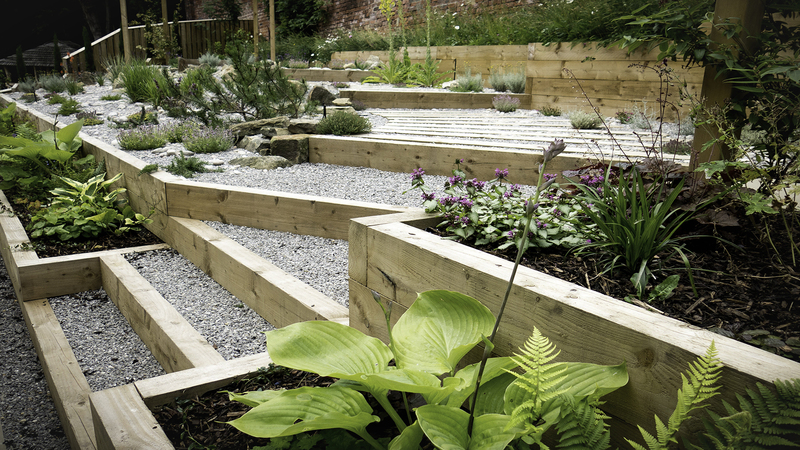 Firstly, we broke up the space by using railway sleepers to create several raised beds as well as steps leading to different zones. This helps to give the garden a more traditional and rustic look. The sleepers were also used to create a winding path through out the garden, marrying together the various areas. The path leads up to the impressive sunburst pergola and circular stone patio. This is the perfect spot to view the whole garden. At the other end of the garden another pergola sits amongst a bustling flower bed and will be used to train climbers. Along the back wall of the garden a raised bed is home to a stunning display of wildflower. This plot is not only a fabulous riot of colour, but the picturesque spot also attracts a whole host of insects and animals. While wildflowers looks great they are also very low maintenance. Mixed gravel has been used to create a textured surface and is intermittently dotted with lemon thyme, red hot pokers and other colourful blooms. Stone has been used to create a warm and welcoming patio area. The flower beds at the front of the garden have been used to plant veg other leafy plants. Overall we have created a stylish country style garden with a very contemporary twist through the use of gravel, modern shape and structural landscaping.